If you hate bugs, then please don't open the following links! Personally, I think the giant isopod is wonderful beyond words! Among other things, it reminds me that, "No one is kinder than Jesus our Creator...or more terrifying!" You might be asking, "How does the giant isopod show us that God is kind?" Throughout history He has made creatures that surely would be difficult for humans to coexist with, because of the Fall (giant dinosaurs, over-sized insects, etc.). In His mercy—presumably—He removed these behemoths from the face of the earth so that—presumably—we would not need to live in constant fear of being eaten. Our Creator is so kind. But fossils of the giant dinosaurs and "super-sized" dragonflies remind us that Jesus is also quite terrifying (Revelation 19:11-21). I experience great joy in pondering the marvels of all these titanic beasts. And I frequently find myself reflecting on the title of Jerry Bridges' wonderful book, "The Joy of Fearing God." Our post-modern society has all-but-lost this ineffable delight! Oh, may the Church of the Living God, once again, be known as a community of "God-fearing Christians." 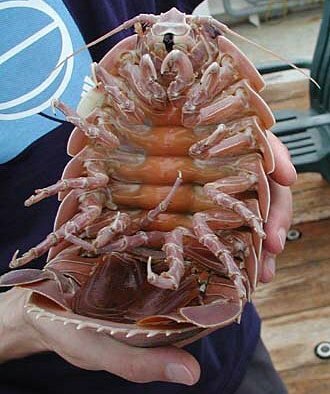 So, when I view a photo of the giant isopod, I am led to worship our King Jesus who is fearful AND loving! I hope you will agree.